President Trump's most recent executive order – calling on the Treasury Department to review its rules for required minimum distributions (RMDs) from 401(k) plans and IRAs – was met with mixed reviews. Generally, under current rules, investors must start to withdraw funds from qualified retirement accounts when they turn 70½ and pay taxes on those distributions as ordinary income. Remember also that an investor with a tax-favored retirement account is permitted to begin taking distributions as early as 59½. RMDs don't have any effect on that allowance. Rather, RMDs simply require someone who has elected to delay their allowable distributions to start taking them at some point. But is 70½ the right age for RMDs to start? Should distributions be postponed by 6, 7, 10 years or even eliminated? HOW IMPORTANT IS THE RMD ISSUE? Beginning in 2016, when the first of the baby boomer generation reached 70½, a growing share of applicable retirement savings had become subject to RMDs, the minimum amount that the holder of a retirement plan account is required to withdraw starting in the year that person reaches age 70½. As a result, throughout the next 20 years, billions of dollars annually will be forced from retirement accounts through distributions that will, in many cases, be taken in the form of a single large annual payment. While RMDs have been mandated for decades, the number of baby boomer retirees is steadily increasing, along with the magnitude of their accrued retirement assets since the Great Recession of 2008-2009 decline. This trend will certainly intensify the effects of retirement withdrawals once these people hit 70½. The increase in number of defined contribution plans came about from the congressional passage of multiple acts throughout the 1970s and 1980s, such as the Employee Retirement Income Security Act and the Revenue Act of 1978. These acts allowed employees more flexibility and control over the amounts and frequencies of funding their IRAs beyond mere dependence on their places of employment for their retirement income. Consequently, IRA funding responsibility often shifted from one's employer to the employees themselves. Yet the increase in defined contribution plan assets seemed to indicate that taxpayers were using them as taxfree income cash cows as opposed to fair retirement income channels. In response, the Tax Reform Act of 1986 dictated that taxpayers must start to receive annual distributions from their tax-deferred defined contribution plans beginning at age 70½. The majority of retirement accounts are regulated by the RMD rule: RMDs must be taken from SEPs, SARSEPs, SIMPLE IRAs, SEP IRAs, and other conventional IRAs and IRA-based retirement plans. Employer sponsored plans, including profit-sharing 401(k), 403(b) and 457(b) plans, also fall under the RMD rule's jurisdiction. The Investment Company Institute (ICI) reported that U.S. retirement assets totaled $24.7 trillion by the close of 2017, of which $8.4 trillion were found in employer-sponsored defined benefit plans and state, federal and local government plans. The remaining $16.3 trillion were in assets subject to RMDs: IRAs had $7.4 trillion; defined contribution plans had $6.8 trillion; and annuities had $2 trillion. 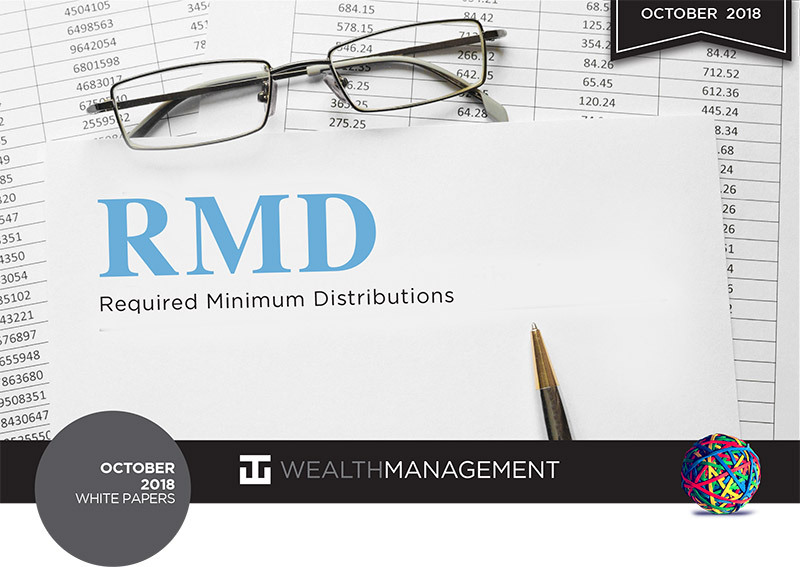 RMDs are calculated with IRS-published Distribution Period tables based on the end-of-the-year balance of the retirement asset subject to required minimum distributions. The mandated minimum withdrawal amount is calculated by dividing the asset's balance from the end of the previous year by the Distribution Period factor for the account owner's age at the time the distribution occurred. The quotient is the amount of the owner's minimum mandated distribution for the present tax year. Individuals aged 70+ numbered about 25.5 million in 2000, according to the US Census Bureau (Fig. 2). Increased by 24% by 2015, this population now numbers 31.7 million and is predicted to reach 37.9 million in the next several years and 58.7 million by 2035. After leveling off after 2035, the population is anticipated to peak again in 2060 at 69 million. 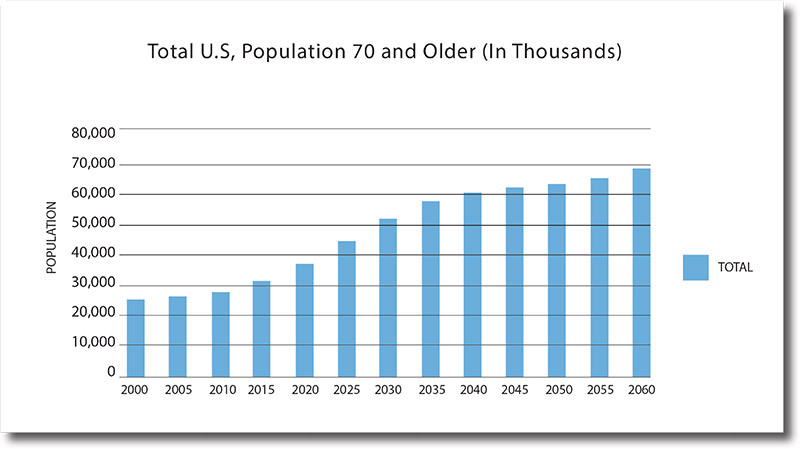 The projected population growth of people aged 70+ over the following 45 years is also charted here. Some say 70½ is too soon for RMDs, as many baby-boomers keep working well into their 70s, and thus don't need the retirement cash right away. Others warn that an RMD age increase could cause a revenue deficit for the government, as less tax revenue would be coming in. The oldest of the 75 million baby boomers in the U.S. turned 70½ in July of 2016, so we are just at the beginning of the age wave, which means much will be extracted from retirement accounts over the coming decades. This, combined with higher life-expectancy rates, has prompted many to call for increasing or even eliminating the RMD age so seniors can control their retirement assets more efficiently. In our opinion, age 70½ is far too soon for forced withdrawals from tax-favored retirement accounts. At WT Wealth Management, we have many clients who are dismayed at having to start taking withdrawals at that age before they really need that money. Some are still working, because they love their careers, are in good health, and fear physical and/or mental declines if they slow down. These clients are forced to take the required withdrawal and pay the taxes on it, but they uniformly reinvest the remaining proceeds in a non-qualified account. The only reason they're taking the money out in the first place is because they're required to. If they were not, the money could remain in their tax-deferred accounts and possibly be passed on to their beneficiaries. In fact, we believe that no one who is still working should be forced to pull money out of a tax-favored retirement account. When combined with a regular paycheck, these distributions can cause taxable income to balloon significantly, thus putting some seniors into higher tax brackets, reducing their tax benefits, and sticking them with higher tax bills that deplete retirement balances. This could be partially resolved by increasing the RMD age to 78, as fewer seniors tend to work into their 80s, and those no longer working in their 70s would have more leeway to plan their withdrawals according to their individual financial goals, including tax reductions and deferments for the subsequent generation. Yet changing the required timing for RMDs could also affect the level of tax revenue coming into the federal government. At the very least it delays it. Depending on tax brackets it could even reduce it. So it's a little surprising that President Trump would propose changing or eliminating this requirement in light of the 2018 tax cuts, a continued budget deficit, and $21 trillion in US debt. True, RMDs were a compromise we had to accept when we began to place money in tax-deferred retirement accounts. But tax revenue will not be significantly affected, mostly just deferred, by an RMD age increase. The income tax bill never goes away since IRAs or 401(k)s do not have the step-up in tax basis at death like non qualified retirement funds and other assets do. Whoever withdraws the taxable IRA or other retirement funds will pay the income tax whenever it is withdrawn. And finally, when we say the U.S. should raise the RMD age to 75 or 78, we don't mean 75½ or 78½. The U.S. government should make the RMD age one that everyone can easily understand. SIFMA Research Quarterly, Fourth Quarter 2017, Research Report. New York and Washington, D.C.: Securities Industry and Financial Markets Association, 2017. "If You're 70½, It's Time to Take Money From Your Retirement Account." The New York Times, December 1, 2017. "Tax Reform: Ending Forced Retirement Withdrawals." Cato Institute, October 17, 2017. "Retirement Plan and IRA Required Minimum Distributions FAQs." IRS.gov. Updated May 30, 2018. "Trump Calls For Review Of Rule Requiring RMDs At 70½." Financial Advisor, August 31, 2018. "Trump order seeks to ease retirement account rules for required withdrawals." "Baby Boomers and Required Minimum Distributions: Preparing for the Big Wave of Asset Outflows." "The Impending Convergence of Baby Boomers and Required Minimum Distributions." BNY Mellon | Invested. New York: The Bank of New York Mellon Corporation, 2016. "Should the U.S. Raise the Age for Mandatory IRA Withdrawals?" The Wall Street Journal, March 19, 2017. Slott, Ed, and Robert L. Meyer. "Should the US Raise the Age for Required IRA Distributions?"